S L A N T – News Alert: SLANT employee is Mayor of Starbucks (239 King St.) and proves Foursquare IS valuable! News Alert: SLANT employee is Mayor of Starbucks (239 King St.) and proves Foursquare IS valuable! So get this. The SLANT team all got a hankerin' for some coffee around 3:30, so we took a break, braved the heat and headed down to Starbucks. The one on King Street. No, not that one - the other one. While standing in line behind other caffeine-deprived patrons, SLANT Art Director, Will Bullock, pulled out his iPhone and checked in on Foursquare - as he is known to do. Then he was all, "Hey guys, I'm Mayor!" Will Bullock, 239 King Street Starbucks Mayor (06.16.10)I know. Big deal - right? I mean, my Mayorships have dwindled to four (I keep telling myself quality over quantity, Al Di La is more important than the gas station up the street) but I do get a kick out of getting that message. This Starbucks has a MAYOR OFFER. It kinda brings a tear to the eye that a big corporation rewards a $500/month coffee habit with a $1 off coupon, one person at a time. 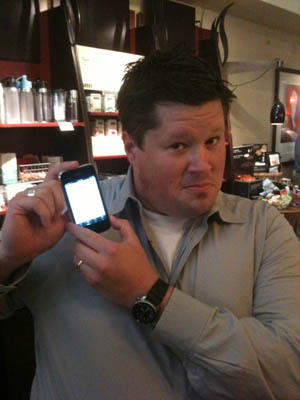 So what if the baristas were slightly confused as Will displayed his mobile coupon and proof of mayorship. They pulled through and Mayor Bullock got his discount. And then bought the rest of us drinks to celebrate, which kinda defeats the purpose of a discount... but who am I to say no to free coffee? Seriously, thanks Foursquare and Starbucks. You made at least one Mayor genuinely happy. People, look for a Foursquare Mayor Offer near you. Congrats Will - long live the Mayor!